By completing the initial environmental impact study in November 2016, the CTA took the first big step toward securing federal funding for the Red Line expansion. The next phase would be to complete a final study. However, to do that, you would need to secure funding, something this project has failed to do. According to Dr. Joseph Schwieterman, a professor at the School of Public Service at DePaul University, after the recession in 2009, Chicago received a great federal stimulus package. Unfortunately, this isn’t entirely true. Though the project has support from local government, the state of Illinois is unable to offer a lot of financial contribution, thus relying on federal government funding for the project. The Trump Administration has previously announced its intention of eliminating the New Starts program and all other federal funding for transit. Even if the project was able to secure funding under the Trump administration, states still have to match any federal funding they receive. With the city of Chicago and the state of Illinois facing major budget problems, their ability to contribute seems incredibly unlikely. The project has been shown overwhelming support by state and local government officials, and residents all over Chicago. 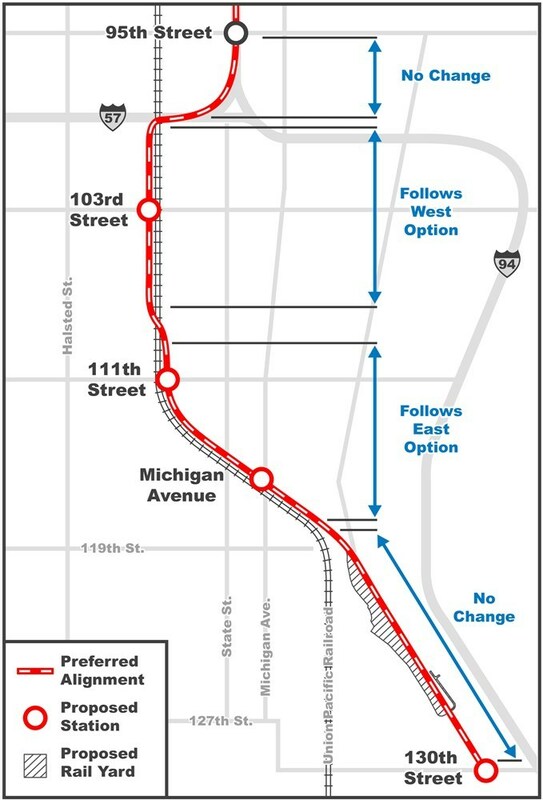 On Jan 26, 2018 the city announced the intended route for the expansion of the Red Line. When viewing the photo and video below from the tour on Google Earth, you get a sense of just how many communities would benefit from the Red Line expansion. This is one perspective from a source living outside of the area, however, many residents and activists in the area believe the new transit line would actually stimulate a lot of economic growth for the area. The new expansion would benefit around 128,000 residents in Chicago’s far south side communities, who are currently living in a transit desert. The expansion would cost a fraction of what it costs to normally commute, and even a smaller fraction of the time. According to the U.S Census Bureau, there is a correlation between unemployment and long commute times in these far south side communities. Riverdale, located about 17 miles south of downtown, had the highest unemployment rate in the city of 41 percent. Of the working residents in Riverdale, 37 percent spend more than an hour commuting to work. Burnside, Pullman, West Pullman, Chatham, West Englewood, South Deering and Roseland and just some of the other communities where unemployment parallels the time it takes for citizens to commute to work. Besides being able to bring employees to there jobs in downtown, the $2.3 billion transit project could bring thousands of construction jobs, further sparking employment development. Riverdale is just one of the majority black communities that has been isolated from jobs and business opportunities by a lack of public transit. According to community activist Deloris Lucas, the average commute to get to the 95th Red Line station on the one bus that comes into the community is 30 minutes. Then add on another 30 minutes or so for people who work downtown, and add another 30 minutes for people who work on the North Side. Lucas lets us know that the “better” jobs are located on the North Side. She goes on to explain how many people don’t have a choice when it comes to taking public transit. “A lot of people have to take public transit. A lot of people don’t have cars to get around…I see a lot of people getting on the bus in the morning going to work. A lot of people work all the way out at O’Hare that I know here”, she says. After looking at Google Maps, the minimum commute time from Riverdale to O’Hare is 1 hour and 29 minutes. The maximum commute time reported by Google Maps was 2 hours and 11 minutes. Both options require multiple transfers from the Metra to bus lines, then finally to CTA rapid transit trains. Neither route takes into account traffic or delays, and that is just one way. The only bus that travels out to Riverdale and its neighboring communities is the 34 line, however, though it runs 24 hours, 7 days a week, it only services once every half an hour. We took the Red Line as far south as it goes to 95th Street, to interview people about their daily commute times. Trina, a resident of South Holland, who lives around 154th and Cottage Grove tells us about her daily 4-hour commute to and from work. Her process of getting to work start with taking the 353 bus to 95th to transfer to the 95th Street Red Line station then takes the red line, transfer again to the 290 bus which takes her to her job. According to Trina, the 353 bus is the only line that reaches her neighborhood. Another thing she told us to consider is possible delays on top of commute time. Another interviewee Geneva, who lives on 139th in Robbins, also faces 4 hours of commute time every day. Geneva takes the 359 bus to the Red Line, then transfers from the redline to another bus line. She says that on average, her commute time is always between 1 and a half to 2 hours. On top of being extremely timely, commuting from far south side communities to get to work downtown can be extremely expensive. A full-time employee living in one of these communities if forced to invest a large portion of their check just to get to their job. If someone works 5 days a week and commutes to and from the far south side, that is a minimum of $100 on transit in one week. For the same amount of money, these residents could ride the CTA rapid transit lines an unlimited amount of times for an entire month. Contrary to some predictions, residents of these communities believe the extension could help reverse disinvestment, as well as segregation. “I see, with the extension of the Red Line, it bringing different companies, new ideas, and creativity to the area”, says Tina Jackson. “For the Red Line to extend, it would be more encouraging for people to work”, added Marguerite Jacobs. Tina Jackson, a resident of Riverdale, said also why she believes the Red Line being in the community would spark positive economic growth and a bigger sense of community. She said, “The extension of the Red Line, it’s going to bring so much money to our neighborhood, and money is one thing that we are missing out here. He adds that we are seeing this in a big way in other cities across the country, where there isn’t any room around transit because development is so intense. “In our city, we may well see that too, because in the North Side, the number of good sites for the kind of residential towers they want to build is getting slimmer and slimmer near transit, and we’re thinking that may push it further south”, he says. “We can’t ignore this neighborhood any longer,” Schwieterman said. And he is right. The biggest question right now is, where and when are they going to get the money? Though we are in a limiting political climate, we urge you to reach out to government officials and address this serious issue that has gone on far too long. Don’t ask officials where the funding is, demand them to find it. Without funding, there is no expansion to the Red Line, and almost 150,000 people will be stuck in a transit desert for who knows how long. If you want to get involved and stay informed, visit https://www.transitchicago.com/redeis/ , this site will keep you updated about the proposed projects, the planning process, and important opportunities for public input and participation. For any questions regarding the Red Line Extension Plan, please contact RedExtension@transitchicago.com. Also check out The Chicago Metropolitan Agency for Plannings’ (CMAP) video below, explaining why the Red Line South extension would significantly improve access to job opportunities, educational institutions, health facilities, and other resources for Chicagos’ south side residents.